Climbing activities continue to increase as an innovative addition in the physical education curriculum. Climbing is a natural instinct in children and participating in these activities enhance self-confidence, decisions making, focusing, goal setting and physical fitness abilities. The freestanding, vertical 6' and 8' outdoor climbing wall is a unique facet for children 3 to 12 years old. Designed with 3 dual sided panels and powder-coated steel posts, the sturdy climbing wall allows simultaneous use for 6 children. Panels feature 120 green and yellow Groperz™ handholds for easy gripping, stability and visibility. Developed for safety and longevity, the low maintenance vertical climbing wall is waterproof and durable, great for playgrounds, schools, parks and community centers. 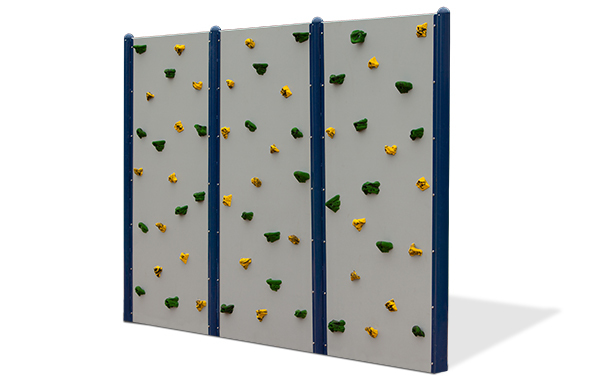 Both the 6' and 8' climbing wall is able to expand with additional add-on panel lengths. Panels available in clear or gray, easily complementing any environment. IPEMA certified and meet ASTM A-82/A-185.